IBASSIN: New Jackall Gantarel Jr! Packing the same lifelike action as its larger original, Jackall Lures now offers its new Gantarel Jr. swimbait. With a 5-inch double-jointed body, a steady retrieve creates a natural ‘S’ swimming pattern, plus the lure will make a 180-degree turns when twitched to further entice a big bass to bite. To add even more realism to the Gantarel Jr. swimbaits, they are equipped with feathered treble hooks. Offered in eight life-like colors – RT Bluegill, Scale Bass, Sale Sparkle Gill, Black Impact Gill, Gizzard Shad, Scale Gill, RT Ghost Gill and RT Spawn Gill, the pectoral fins on the Gantarel Jr. enhance stability, and are angled slightly to t allow the swimbait to dive down to 2-feet. 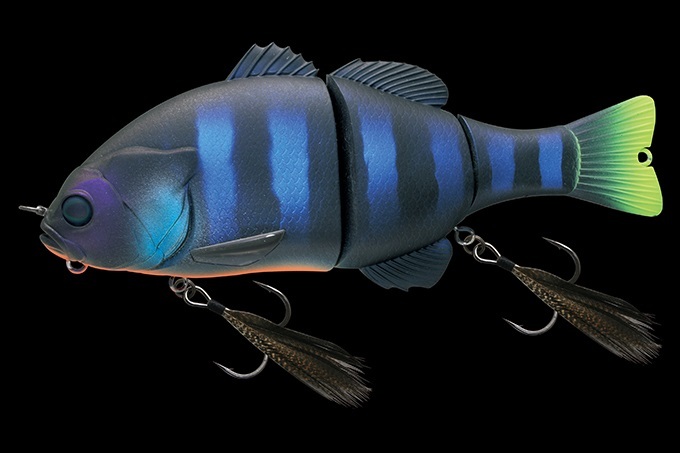 The 1.5-ounce Gantarel Jr. swimbaits feature a bearing swivel eye to eliminate any line twist. The lures offer a bottom eye so anglers can add weight to make the lures slowly sink even more, plus there’s a tail tip eye to add a stinger hook.